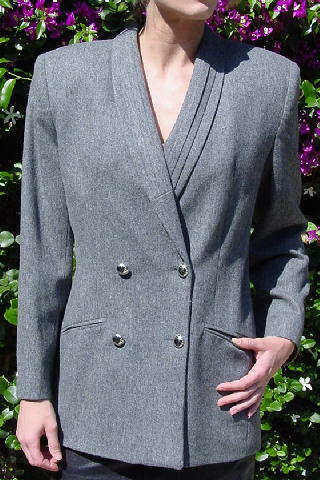 This vintage medium gray jacket is by Oleg Cassini. It's double breasted and has four silver-tone buttons in the front. There are long sleeves with one button on each and it has shoulder pads. 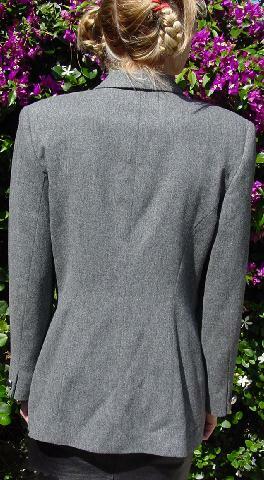 The long lapels have a three pleat appearance, and there are 2 lower slash angled pockets still sewn shut. 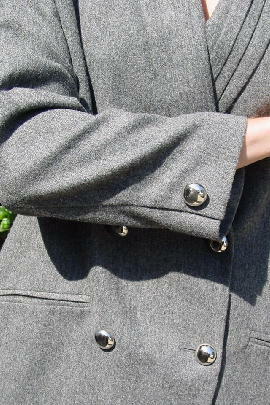 It has a nice gray lining and it looks and feels like wool - there's no fabric content tag. A model got it as a present from her exhusband. She thought about destroying it to spite him, but decided to sell it instead.